Surge suppressor solutions support data center power to reduce downtime and extend equipment life. Liebert products, solutions and services from Emerson Network Power optimize data center infrastructure through cooling and monitoring technologies. A true hybrid device offering a coordinated multi-stage system of suppression, integrating the fast response time of the SAD (Silicon Avalanche Diode) modules with the high-energy capability of the MOV modules. Superior clamping at surge current ratings up to 375kA per mode or 750kA per phase. 570 (Hybrid) builds upon the industry standard 560 Series. Patented component level monitoring â€” including neutral to ground. Unique sand-packed silver fuse network UL Rated at 200kAIC for safety. All surge suppression components used are computer tested and matched. SADs are matched to +/- 1% and MOVs are matched to 1 volt for optimum reliability and long life. Highest surge current capability and survivability in the industry. 10-year warranty on parts and 5-year on-site labor, backed by Emerson Power Service. True, coordinated multi-staged system of suppression. Lowest UL 1449 clamping voltages achieved. A modular design with available surge current ratings from 160kA to 1000kA per phase. 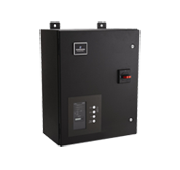 Provides facility-wide surge suppression and EMI/RFI filtering at service entrance and distribution panels. A modular or non-modular line available at surge current ratings up to 250kA per mode or 500kA per phase offering continuous protection from damaging transients and electrical line noise. High survivability to repetitive surges without degradation. Provides “True Surge” against transients. Retrofits easily to existing distribution panels. Retrofits easily on existing panelboards. Attaches directly to breaker panel. Monitors all modes of failure, including neutral to ground, with patented detection circuitry. Offers easy, safe, and maintenance-free operation.